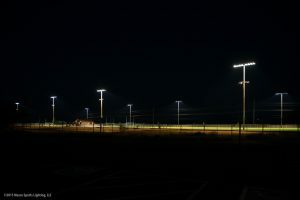 In recent years, IDA has witnessed a marked increase in the number of outdoor sports lighting complexes built in urban and suburban neighborhoods. In the U.S. alone, it is estimated that more than 2,000 outdoor sports lighting complexes are either retrofitted or installed every year. Outdoor sports lighting facilities are constructed at schools, parks, and neighborhood complexes. The excessive amount of light associated with these complexes can be a nuisance for neighborhoods and create significant environmental impacts. Until recently, it has been difficult to control generated lumens to the level desired for dark-sky compliance because luminaires used legacy bulbous lamp sources (incandescent, metal halide, high-pressure sodium, etc.). These sources and the reflectors housing them are too large to effectively shape the light to the field of play, causing unwanted spillage and undesirable glare in the surrounding communities. These two photos were taken at the same facility, on opposite sides of the access road. (Left) Pointed toward the athletic field. (Right) Pointed toward the neighborhood. Recent advances in LED lighting technology, however, have offered lighting designers the opportunity to develop lighting sources strong enough to light the field of play, and small enough to be effectively shielded. With these advances in lighting technology, recreational sports lighting can be configured and designed to be effectively shielded to illuminate the field of play and minimize or eliminate glare and light trespass. Minimizes neighborhood lighting nuisances by greatly reducing the allowable spill and glare disruption. Quantitative pass/fail thresholds are established. Manages high angle glare, thus off-site light trespass and sky glow effects due to direct and reflected light are dramatically lower. Mandates curfew requirements, thus mitigating neighborhood nuisance factors and sky glow effects which benefit flora/fauna and night sky enthusiasts’ and astronomers’ views of the night skies during peak viewing periods. Limits the class of play to recreational levels, thus discouraging over-lighting practices. Promotes “Best Lighting” practices that minimize lumen densities, which reduces energy consumption, benefiting the environment at-large. Now sports lighting designers may apply to IDA for certification of their designs. 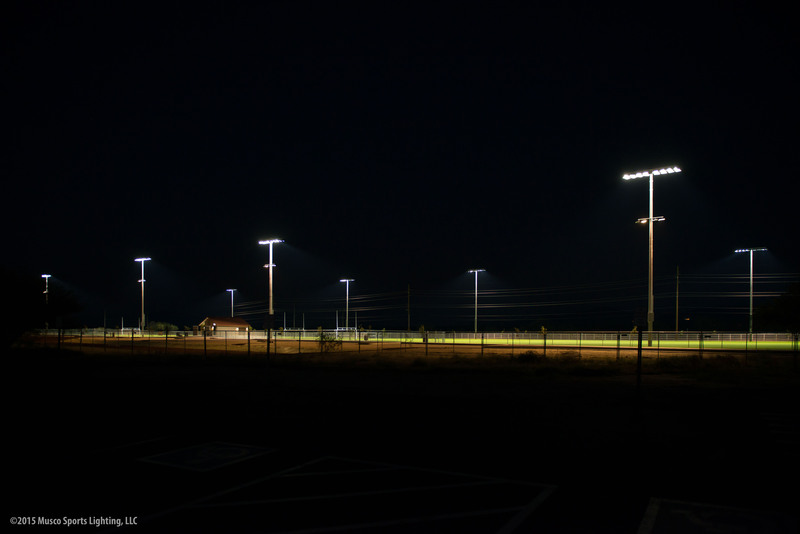 Fields in full compliance with the IDA Criteria for Community-Friendly Outdoor Sports Lighting may receive recognition from IDA and an award plaque, recognizing efforts to minimize light pollution. Phase II provides the option for designs with an IDA Phase I Certification Letter to have the facility, once constructed, professionally evaluated and validated as conforming to the Program guidelines by a site visit. Facilities meeting the design specifications will receive an IDA Field Verification Letter and be provided an award plaque. To learn more, visit www.darksky.org or contact IDA’s Technical Director, Pete Strasser.